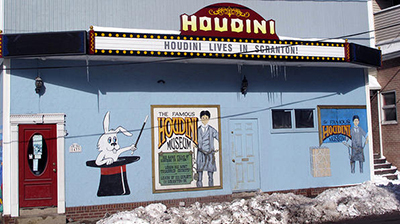 Celebrate the magic of Harry Houdini ! To Order a Harry Houdini T-Shirt. ... Harry Houdini ... The greatest magician of all time. Magician, Escape Artist, Movie Star, and Esposer of gambling & psychic frauds and cheats! Spend a magicial visit with Harry Houdini ! 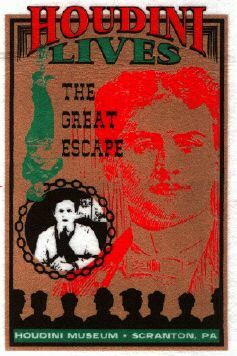 Go to Order form for Harry Houdini Posters, Harry Houdini T-Shirts, Harry Houdini Souvenirs, Harry Houdini Books, Harry Houdini Magic, etc. Sizes: Childs, Small, Medium, Large, Xtra Large. Make checks out to Magic USA. For out of country orders add appropriate postage. © 1993-2009 by The Harry Houdini Museum. Except for reviews, no part may be reproduced in any form, without written permission. Graphics have been retouched, computer enhanced and resized by the authors. This web site includes Harry Houdini biography, Harry Houdini tricks, Harry Houdini death, Harry Houdini quotes, the Harry Houdini movies or Harry Houdini movies, our Houdini Inc., Harry Houdini real last name, and Harry Houdini magic.